I could kiss my crockpot/slow cooker. Thanks to it, these ribs came out perfectly tender with very little effort on my part. You could prepare this in a dutch oven (click on the Epicurious link below for the original recipe using a dutch oven) but adapting the recipe for a slow cooker was more my style. I especially liked that I saved a bit of energy plugging in instead of gassing up my oven. I prepared the recipe with a few substitutions and measurement adjustments to suit my tastes but overall this comes together very quickly. Don't let the list of ingredients fool you! Half of the ingredients are whizzed in a blender to create a chile sauce while the ribs are browned before placing in the crockpot. The chile sauce and brewed coffee are poured over the ribs and then you walk away. Hours later, dinner is on the table and a delicious one at that! I served this over garlic mashed Yukon potatoes, and roasted carrots and asparagus. Soak ancho chiles in boiling-hot water until softened, about 20 minutes, then drain in a colander set over a bowl. Transfer ancho chiles to a blender and purée with onion, garlic, chipotles with sauce, maple syrup, lime juice, and 1 teaspoon salt; set aside. Pat ribs dry and sprinkle with pepper, garlic powder and remaining 2 teaspoons salt. Heat oil in a 12-inch heavy skillet over moderately high heat until hot but not smoking, then brown ribs in 3 batches, turning occasionally, about 5 minutes per batch. Transfer browned ribs to a crockpot. 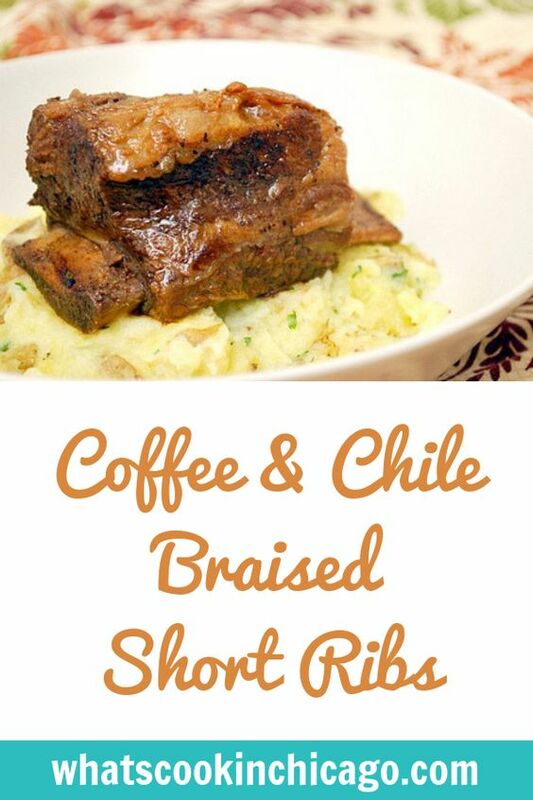 Pour the coffee and pureed chile mixture over the ribs in the crockpot. Cover and cook on high for 6-8 hours or low for 8-10 hours or until tender. 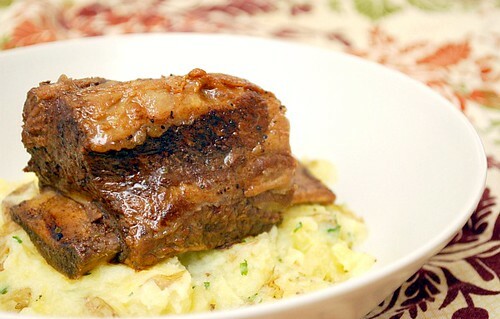 I've recently become a huge fan of short ribs and I love the depth coffee rubs give to meat. These sound amazing! Yum, yum, yum. I feel that I have been seeing lots of beef and coffee recipes lately. I definitely need to give it a try.